Hussein Chalayan, exhibition view from I am sad Leyla at Galerist, İstanbul, 2011. For Part 1 and our introduction to the mini survey below, click here. For Part 2, click here. Hussein Chalayan, exhibition view from I am sad Leyla at Galerist, Istanbul, 2011. When you say public space, the first thing that comes to my mind is the issue of plural identities. I wonder whether it is possible to make a work that includes everybody, a work that does not leave anybody out. Hussein Chalayan has a work called “Immanence of Desire”, exhibited at this fair. This work reminds the viewer of signs that show flights, destinations—the signs that move with a “tic” sound. 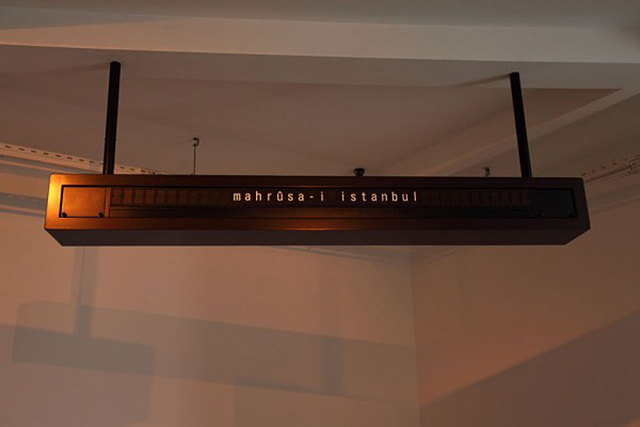 If I am not mistaken, it shows Istanbul’s 72 names. I first saw this work at the Galerist exhibition, “I am sad Leyla” and I was really impressed. In this exhibition, the work was exhibited in a corner room. I always thought of what would have happened if this work was displayed in the public space, for example on Istiklal Avenue, instead of within the gallery. The work makes you a traveler when viewed—there is a very emotional, personal connection. Maybe it is not perceived as an intervention, but I always regretted the lack of discussion around this work that produced its own publicness. Let me tell you about the ideal public art project in my mind. I find it very important in contemporary art to move towards relation, interactivity—to bring people together. Method is more important than content for me. Let’s do a thinking exercise. A dentist used to live in a space. We bring a giant tooth there and do something monumental. Or you can ring the doorbells and say that a dentist used to live there, we want to do something about it, if you find this useful, you can give a tooth too and we can bring all of the teeth together. What I care about is not only the participation. What’s most important is people not paying enough attention to art works. If such methods are followed, I think that the fights about the sculpture in Kars or the discussions on the Military Barracks in Taksim would be minimized. Issues of whether a work should be erected or not, whether people wanted it or not, could be prevented with this method. For the first two and a half years at the Pasaj, we responded positively to all the applications that were mature enough to be considered projects. Of course, there were also artists that we invited. Participatory, socially-engaged projects or works that developed over the process of making it were more fulfilling for both the viewers and for us. I believe interactive projects that the viewer could go into and change should be made more visible. I encounter a lot of works that do not take the viewers into consideration. For example at the beginning with Pasaj, the viewers who came in were mostly artists, curators, or collectors. Then we started doing projects with the people around us. There was a surprisingly large and positive contribution. For example, a shop owner would come and ask our artist, Elizabeth, “Elizabeth, why did you do this? Wouldn’t it be better if you did this in red?” These direct and sincere responses were great. This might not be the perfect critique but it is a voice. We, as practitioners of contemporary art, usually withhold our thoughts. We say this is the artist’s decision and keep quiet. The artist also does not want to be criticized and thus does not criticize others. While most other people say what they want about art. Of course, the artist’s response to the viewer’s opinions is also very important; he/she can see it as a criticism or a threat. In the new season, we want to continue with our projects in our new space in Tarlabaşı. Of course, we have to build a relationship with the texture there. We know that it will take time but we are patient and motivated enough to make it happen. The first thing that comes to my mind is Ahmet Öğüt’s suggestive article on the 13th Istanbul Biennial. As the preparations for the biennial continued, Gezi protests were charged with a properties of what we could call art in the public space. And after this, the biennial declared its withdrawal from public space. Ahmet was asking why it was not possible to have an anonymous approach in such an environment. Let artists come to the city, everybody can pick a location, they can put their work in the public space, but without a name, without a signature, without mentioning the biennial. I really liked this idea. When encountering an art work in the public space, not knowing whether it is an art work, to question that very notion…anonymity afford this opportunity. Anonymity is one of the most important qualities of the public space and of the public. Unfortunately, we do not have such an understanding of anonymity here in Turkey. We have to create that. This is why I think Ahmet Öğüt’s proposition was a good one. There is quite a few construction projects around us. I frequently find myself thinking about their impact on public art. In many countries, the “percent for art” policy is implemented, which dictates 1% of the budgets for large-scale construction projects to be dedicated to the arts. I’m talking about sanctions that will increase the visibility of art in the public space to offset these construction projects’ transformation of the environment—their large-scale intervention. This is one of the most effective methods of getting people to interact with art in the public space. In Turkey, there is no legal mandate, but there are some initiatives, which are unfortunately merely decorative. Such legal policies would enable art to penetrate daily life and make the works more tangible, shareable. We need to think about the causes and effects of the absence of such a policy. Posted in content, on artists and tagged Aslı Seven, Mehmet Dere, Rumeysa Kiger, Serkan Taycan, Zeynep Okyay. Bookmark the permalink.